Day 4 of our Transformers: Generations Wv.2 Combaticon reviews and today we're going to take a look at the lone wolf that is Bast Off. Blast Off is tagged as number 2 of 5 in the "Decepticon Bruticus" set, and of course, as you know, I'm working my way up. 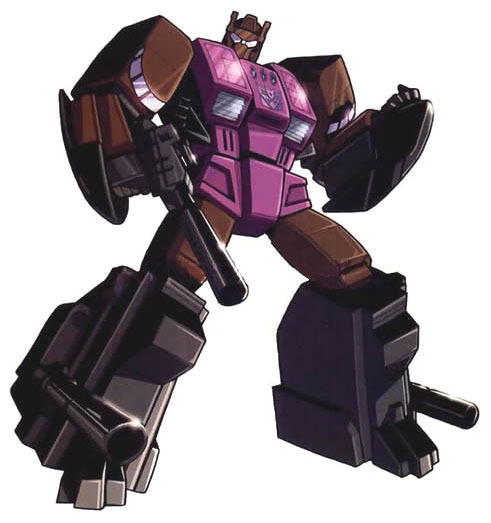 We've seen Swindle and Brawl, so we have our legs. Onslaught came next, so we have a torso. With Bast Off, we're giving Bruticus a mitt to pummel things with. Is Blast Off out of this world, or stuck in orbit? Take a look after the jump. Blast Off is a loner, but not by choice. His Alt-mode grants him a freedom that few other Transformers can achieve and because of that, a lot of his time is spent in space... cold space... cold, black space... cold, black, quiet space... cold, black, quiet, empty space... yeah.... So. Yeah. Blast Off spends a LOT of time alone. But, he hides it well by being pompous and claiming that he is above all of his comrades because he's capable of doing what they can't. He is by no means weak though; his powerful X-Ray lasers can fry an Autobot from orbit... so there's that. he shoots from up above... far above... in solitude. Blast Off comes to us... by himself... on the standard red card for the newest Generations line. The front has some excellent artwork of Blast Off's Bot-mode. The card insert stresses that this is the Fall of Cybertron version of Blast Off along with my new personal favorite phrase, "BUILD GIANT ROBOT!". The back of the card (OH! Full card back pic this time!) gives us a Bio, Tech-Spec readout, shots of both Bot and Alt modes, and Blast Off's place in the Bruticus scheme of things. As far as a first impression goes... I get the same light feeling I got from Blast Off's previous comrades. He just feels light. He doesn't look as hollow as Swindle or Onslaught but he doesn't look as solid as Brawl either. His shoulders are massive but only take up space and limit his arm articulation. The Fruit-Stripe Combaticon theme continues! Blast Off in molded in primarily purple and black. Silver paint deccos show off his engine and he has a few spots of yellow as well. Purple and yellow? I learned in art class that it's not always best to mix opposing colors; but it works alright on Blast off. Blast Off comes with a pair of pistols that actually look good... unlike Onslaught's oddly shaped cannon. as I already mentioned, his shoulders are MASSIVE and the articulation is a little odd. The arms are mounted to the engine casings that make up his shoulder and those in turn are mounted on some really small bars that once snapped into place in Bot-mode, don't want to move. His arms were constantly popping off as I was posing him. The shoulder also make him back heavy. Despite the weird arm joints, Blast Off is fairly easy to get into his "Cybertronian Rocket Plane" Alt-mode. Start with popping the small bar out of place separating his shoulders from his torso. Fold his arms at the elbow up into the engine housing. Swing Blast Off's arms behind his back and connect them together. Flip his chest plate up to form the front of the 'rocket plane'. Blast Off's legs fold up at the knee and then into the thigh and rotate outward to form the Alt-mode's wings. There are two peg holes, one on either side, of the engine that Blast Off's pistols can fit into; arming his Alt-mode. Blast Off's Appendage-mode is not too difficult to achieve from this point. Starting in Alt-mode, remove his pistols and then unhook his legs from his body and swing them all the way out to the back. Fold Blast Off's legs in half and then rotate them at the top of the thigh so that the hollow halves of his legs are facing down. I found that even when transformed correctly, these pieces do NOT like to stay together. There is only one tab/slot connecting spot and it seems that a lot of pressure rides on it. The pieces that comprise Bruticus's hands fold out from the lower leg. You'll notice that there are two thumbs so you make Blast Off either the right or left arm Since, traditionally, Blast off forms Bruticus' right arm, that's what I went with. Rotate the connector port out fron under the front of the Alt-mode and you have Bruticus' arm. I noticed that when transforming Blast Off in this way, Bruticus' arm almost ridiculous in length. It makes Bruticus look like a knuckle-dragger. I went one step further and folded his legs back up almost to Alt-mode proportions. This put more stress on the connector and the legs really want to pop apart... but I think it looks a lot better. I didn't take pics of it, but Balst Off's Alt-appendage mode is really just his Alt-mode stood on end with the connector port folded out. Yay. Over all, Blast Off is a decent fig. Like the rest of his brethren, a few changes here and there could have made a good figure great, primarily his leg and appendage transformations. But still, I'm happy that Hasbro has finally given us a combiner after SO long without one. FP Blast off is WAY shorter than his Generations counterpart. His Appendage and Alt modes however, are comparable in size. So far, generations Bruticus looks like he came from the Generations line. By that, I mean it looks like Hasbro tried and settled with what they pulled off on the first try. In my own humble opinion, I still prefer my FansProject upgraded Bruticus. As you can see, I've attached Blast Off using the short arm method I preferred during transformation. I think it looks much better than the longer arm version the instructions suggest. Check back in tomorrow for the final member of the team, Vortex! Pics, review, and cold... dark... empty... space... by Scion of Primus. This is a good and honest review, but the way you've been comparing this Bruticus to the FP one is a bit unfair. It's hard to compare a Hasbro/ Takara product to a 3rd Party one, since obviously the 3rd Party will be better 95% of the time. None the less, these are great reviews even with my pickyness. I....love...his colors. I didn't think I would at first, but they're pretty awesome! Great review! I wish my stupid local stores would get them in so I could buy Blast Off and Brawl. I really want to get a least two of these guys in the store! https://paxcybertron.wordpress.com/2012/07/31/sdcc-combaticons-blast-off/ - this is another way you can transform him in arm mode. It keeps it short, but allows for articulation. I also did a post on his "flame thrower mode". Thank you RPM! I know I've been a little hard on the Hasbro product... I'm just a 3rd Party whore. I just love their stuff so much more because I feel that they are giving fans what they want in terms of characters in honest representations at an amazing level of quality (most of the time). Don't get me wrong though, I still love me some Hasbro mainstream product and I'm happy that Hasbro is finally putting something like this out and it's good to see them produce something of this scale without charging the 3rd party prices. Haha, it's really nothing against you. In a way, it is actually fair since Hasbro SHOULD be able to do better than a 3rd Party product.